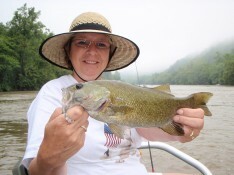 The French Broad has fished pretty good this week; trips averaged about 30 smallmouth per 1/2 day trip. T-storms have been an issue, both in staining the river to some degree and soaking fishermen. Still, the smallmouth bite has been strong, especially in the mid-mornings and evenings. As usual in the summer, try to avoid the middle of the day. Fish are holding in the classic smallmotuh spots now: behind rocks, inside seam lines, in shallow runs. Crankbaits and bright colored grubs have been effective. Call Chris Manderson, 828 216-1336, or visit www.whitewatersportsman.com for more information about fishing the FBR. Rachel and a nice smallmouth caught near Asheville, NC. Nothing beats floating down the river on a cool mountain day. See the eddy, flip back the bail of your spinning reel, toss the lure, and retrieve. It doesn't get any better... at least until a strong, river smallmouth strikes your line and the fight is on! Fishing Asheville, North Carolina, we offer guided fishing trips in the French Broad River Basin floating in rafts equipped with fishing-specific oar frames. Efforts are concentrated on the main French Broad River, with several tributaries providing quality options as needed.